Dedicated to father of the nation, Mahatma Gandhi, Raj Ghat is a memorial located in New Delhi, which was built after he was assassinated when on his way to the meeting at the Birla house. Earlier an ancient Ghat on the banks of River Yamuna was called Raj Ghat. Raj Ghat is primarily a twelve by twelve feet square platform which is made up of black marble. This platform represents the place where Mahatma Gandhi’s last rites were performed on the next day of his assassination, i.e. on 31st January 1948. Since then it has been a tradition for all the Indian and foreign dignitaries to offer their respect at the Ghat on all the important occasions. All guests are required to remove their footwear before entering Raj Ghat as a mark of respect. This memorial was designed by Vanu G. Bhuta. The simplistic structure of Raj Ghat represents the simplicity of Mahatma Gandhi. This structure of black marble with a height of two feet is surrounded by fence of white marble. It is an open platform with only the sky above it. On the memorial the last word of Mahatma Gandhi ‘hey ram’ have been inscribed. There is also an eternal flame at the site. 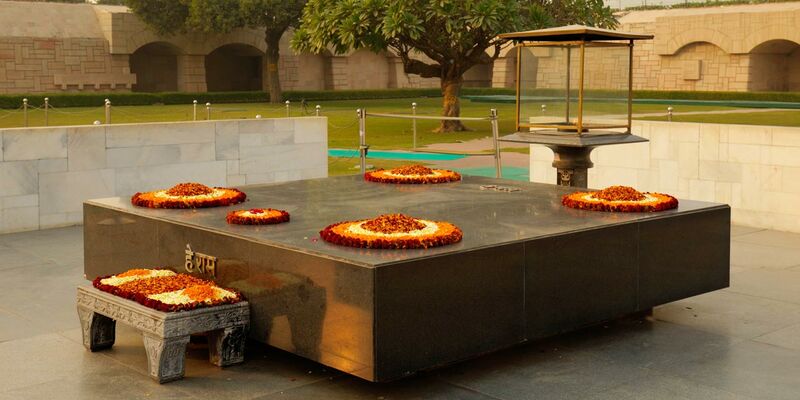 On to the north of Raj Ghat, Jawaharlal Nehru’s samadhi is located, it is known as Shantivana. Surrounded with lush greenery and fountains, Raj Ghat also presents a view worth admiring. A captivating park surrounds the Raj Ghat. In this park, there are trees which have been planted by various leaders from the world such as Former US President Dwight D. Eisenhower, Queen Elizabeth II, Former Prime Minister of Australia Gough Whitman, Ho Chi Minh and many more. Near to Raj Ghat, two museums showcasing the life of Mahatma Gandhi are also located. Raj Ghat timings are from 6:30 am in the morning to 6:00 pm in the evening. It is open on all days of the week. On every Friday of the week a special prayer meet is conducted at the Raj Ghat at 5.30 PM. Raj Ghat Delhi is located between the ring road and the Yamuna River banks. It is located only 4 km away from Janpath market, which is popular shopping hub in Delhi. Tourists can travel via roads and metro rail to reach Raj Ghat. The nearest metro station to Raj Ghat is the Kashmiri Gate. The address of Raj Ghat is Gandhi Smriti, Raj Ghat, New Delhi. While visiting Raj Ghat, you can also pay a visit to nearby attractions such as Khuni Darwaza, Vijay Ghat, Vir Bhumi. Shakti Sthal, etc.